Who doesn't love some quality trash talk? We're about 3 weeks away from Opening Day, which means it's the middle of draft season in fantasy baseball. I'll break down the current Blue Jay's squad for fantasy purposes, using the NFBC ADP and Fantrax ADP's for each player. There might be differences in ADP's based on the time, league settings, and other variables that can be league-specific. 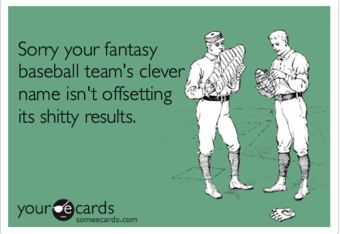 One common mistake people make in fantasy leagues is not understanding the scoring set-up and subsequent strategies. Head-to-Head leagues with either categories or points might differ from the traditional 5x5 rotisserie leagues. It's important to understand your league's settings and scoring before the draft and make adjustments accordingly. For those of you who don't play or aren't interested in fantasy leagues, I tried to spice it up with GIF's and videos. GIF's are in these days, right? Josh Donaldson is three years removed from an MVP award and was a consensus first-round pick heading into 2017. Calf injuries caused him to miss time early in 2017, and both him and the Jays never really got on track in the first half. Donaldson was red hot after the all-star break, posting a slash line of .276/.386/.606 with 24 homers, 53 RBI, and a 160 wRC+. The calf issues seem to be past him, and a full year of a healthy Donaldson would provide low-end 1st round value. He won't provide any steals and third base is a pretty deep position, but he seems to be slipping too far. I'm in with him at his current price and took him in the second round of the Great Fantasy Baseball Invitational with the 24th overall pick. What's that about a contract year? Go earn yourself money with a big year. At least he could probably pull in some dough elsewhere if things don't well on the baseball diamond in 2018. Marcus Stroman is an interesting case when it comes to fantasy baseball. With the shoulder inflammation announcement, his ADP is currently plummeting. Depending on when your draft is, and any other updates that come out about his status, he could end up being a steal on draft day. Stroman was one of only 19 pitchers to throw 200 innings last year, which raises his value in both points leagues and leagues that count quality starts as a category. I de-value him slightly in roto leagues, where I like to place emphasis on ratio protection, where ERA and WHIP are two of the five standard pitching categories. He has had ERA's of 4.37 and 3.09 the past two years, with his true talent probably falling somewhere between his FIP in those years of 3.71 and 3.90. His K/9 rates are pretty average, at just above 7 strikeouts per 9 innings, despite posting double-digit numbers every year in the minors. Papa Buerhle really must have made an impression, as he works quickly and efficiently and provides a reliable 200 innings. This allows him to go deeper into games but unfortunately limits his upside in fantasy because of the low strikeout totals. I do think the upside for more is in there somewhere, as he has started to throw his slider more, which is his most effective pitch and generates a lot of swinging strikes. You'll see a lot of his slider in this video, put together by Nick Pollack of PitcherList.com. This vid is also a good watch if you are already over watching the Grapefruit League and want to get amped for the real games to begin. It can be said that Roberto Osuna had a down year in 2017. His ERA rose nearly a full run, and he registered 10 blown saves compared to 6 in 2016. Factor in some off-the-field mental health and anxiety issues and you have yourself a forgettable season. But when you dig into the numbers, he was actually much better in 2017 than he was in his entire career. It appears there was some bad-luck that factored into his season. His BABIP rose by 30 points, he lost just over a MPH on his fastball, all while his strand rate was 10 percent below league average (59.5 LOB% vs 82.5% in 2016). Other than that, basically every other important statistic was improved. His K per 9 raised from 9.97 to 11.67. His walks per 9 lowered from 1.7 to 1.27. Yeah, those were both in the top 3 of all RP's in the MLB. His HR/FB% was nearly cut in half. His groundball rate? Also increased, from 33.2% to 48%. Check this out: his 2016 ERA was lower than his FIP (2.68 vs 3.20). In 2017, it flipped back, as his FIP was at 1.74 vs 3.38, which helped him post 3 WAR despite the perceived 'struggles'. The last under-22 reliever to post 3 WAR was K-Rod, when he burst on the scene with the Brew Crew in the mid 2000's. He's going as the 5th or 6th closer off the board when I'd rank him right there with Kenley Jansen and Craig Kimbrel. Relievers are volatile, and there is some injury risk with Osuna, but he seems to have added some muscle during the off-season which could help him regain that velocity he dropped and keep him healthy in 2018. I took him as my first closer in the GFBL, 97th overall. I guess it feels like I'm always down on Smoak, but I have a tough time believing he comes close to the 38 big flies he hit last year. If you want a laugh, read what I wrote going into last year about him and then look at how his slash line proved me wrong; a career high .270/.355/.529. He was basically the only bright spot in a bad year for the organization, as they turned what looked like an unnecessary 2 year deal with an option into an absolute bargain. Statcast's xwOBA seems to believe in his breakout, so I think there is something here, but I think we just saw the best year of his career. Travis Sawchik and Jeff Sullivan both wrote articles at FanGraphs explaining his breakout last year. His fantasy value is tied to hitting the ball out of the park, and if we set the over/under of home runs for 2018 at 24.5, I'll take the under. Keep proving me wrong, kid. Not entirely sure why I'm including Tulo in a fantasy post, as nothing has seemed to change with him. In a shocking turn of events, it appears manager John Gibbons is preparing to enter the season with Tulowitzki on the DL. I was a huge Tulowitzki fan before he came to Toronto, and was extremely happy with the trade to acquire him. Reyes was clearly declining at short and was owed a large amount of money. Then GM Alex Anthopolous was able to turn Reyes into Tulowitzki, and the problem of having a declining shortstop on an expensive contract was solved. As it turns out, the problem was only deferred a few years back, as Tulowitzki entered his decline phase seemingly as soon as he put on a Blue Jay uniform. It's hard to rely on the incumbent starters in the middle infield, as both Devon Travis and Troy Tulowitzki will have to prove they can stay on the field and contribute. Ross Atkins did a great job acquiring some cheap depth in Yangervis Solarte and Aledmys Diaz, and I consider both of those guys the starters (Diaz at short and Solarte at second) until proven otherwise. The middle infield is one to avoid for fantasy purposes, though maybe Solarte could be useful as a depth player who can cover multiple positions. I think there are legitimate workload concerns with Sanchez, but the stuff is pure filth. If the blister issues pop up again than the team will have serious issues replacing the impact he can provide at the top of the rotation. If Stroman isn't ready to go at the start of the season, Sanchez is as good of a bet as any to get the ball on Opening Day to face a new-look Yankee squad. The American League ERA leader in 2016, all early reports out of camp thus far appear to be positive. Despite not showing it, he has posted similar K rates as Stroman (7.55 in 2016) while his walk rates are a little higher. Pre-2016, there were issues with his control and his ability to get left-handed hitters out. 2016 was his breakout, and then he lost basically a full year of development. His range of outcomes is very wide but I'm willing to take my chances that 2017 is put behind him and he can build on his excellent 2016 season. This outfield is pretty uninspiring from a fantasy perspective. The only guy guaranteed playing time is Kevin Pillar, who is known more for his defense than his bat. If he could only learn to take a walk. I don't mind the moves they made in a vacuum at their acquisition cost, but can't help feeling like there is an impact bat missing. Anthony Alford could be that guy, and if he does come up he should be getting regular at-bats and would immediately be on the fantasy radar due to his power and speed combination. Grichuk has some pop, and if he can cut down on the K's he could be a sleeper candidate. I'm curious if they let him run a bit. Toronto is not known for being a team that steals a ton of bases but that could be more of a roster composition issue than a team or managerial philosophy. I'm not entirely sure what Grichuk brings that Teoscar Hernandez couldn't provide, but the pieces given up weren't anything special and additional depth is never a bad thing. A Pearce/Granderson platoon in left field has some sneaky upside, though if they falter or either Hernandez or Alford manage to earn a role on the team they aren't etched into the roster in stone. There are 5 capable options here, with Alford being the 6th man like Lou Will with the capability to make an impact later on. J.A. Happ has been a dependable starting pitcher since his adjustments as a Pittsburgh Pirate under Ray Searage. He throws a weird fastball that has rise to it and is effective in the top half of the zone, which can be dangerous if the command is off on any given day. He actually has a higher strikeout rate than both Sanchez and Stroman in the past two years and only has minor injury concerns considering he's a pitcher. I tend to chase upside and take the 'mystery box' late in drafts of prospects and potential breakouts, but Happ can be a reliable guy late in drafts. If you're a believer in Estrada's change-up and soft contact results, he's going a little bit later than Happ and had his numbers skewed in 2017 by a horrible June. I don't have a ton of interest in either him or Garcia for fantasy, but if Biagini gets an extended chance in the rotation he might be the most intriguing of these options. I'd really like to see him stretched out as a starter to begin the year, either with Buffalo or in the big league rotation if either Stroman or Sanchez isn't ready for March 29th. If you want to wait on the catcher position (which is not a bad strategy, especially if you miss out on the big 3 of Sanchez, Contreras, and Posey) he's about as good as any of the rest. He's hit two bombs already in camp and has added a bit of weight back after slimming down in 2017. He's entering his age 35 season, so I doubt he handles a full workload like he has in his prime, and that will hopefully keep him in the line-up a bit more. If he's sidelined for any amount of time, I'd say Danny Jansen is next in line to come up, after breaking onto the FanGraphs Top 100 list this year. My money is on Reese McGuire edging out Luke Maile for the backup catcher role in camp, but it's possible they send him down to share time with Jansen or spread them out at AA and AAA to maximize playing time. This seems like a good a spot as any to gather up any interest in a group fantasy league. We've done it on ESPN the past two years with the Commissioner duties being handled by Steve-O, and I'll try and get in contact with him to see if he wants to keep the role. If not I'm willing to go through and set it up. We have the option to switch from ESPN to Fantrax and have money kicked into the pool, but it is a bit more advanced of a fantasy platform and doesn't have quite the mobile-friendly app available. I'll leave it up to you guys, I have no problem setting it up and playing again on ESPN. I liked the H2H format last year, though I would recommend adding more playoff spots. We could also do a traditional roto league like in year one. I'm open to any ideas and suggestions, just let me know what you're interested in and we can settle on the categories and league set-up.